You ready for multiplayer action? 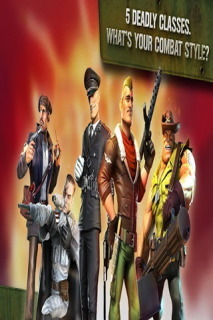 Axis or Allies, victory or defeat, mayo or mustard&hellip; All will be decided in the ultimate FPS showdown, Blitz Brigade!Become one of five highly skilled and totally badass classes and team up with other players to pound your enemies into the dirt and call them mean names. Finally, a true class-based multiplayer FPS game comes to Android! ???? ?Lock 'n' load for team-based FPS action!????? ???? ?War games just got a whole lot crazier! ????? For fans of free online action games, class-based multiplayer shooters, first-person shooters, army/war games, or anyone who enjoys a good online fight.Enter the battlefield, get ready for the war, and enjoy hours of fun! For optimal performance, we recommend restarting your device and closing other applications before playing Blitz Brigade.----Visit our official site at http://www.gameloft.comFollow us on Twitter at http://glft.co/GameloftonTwitter or like us on Facebook at http://facebook.com/Gameloft to get more info about all our upcoming titles.Check out our videos and game trailers on http://www.youtube.com/GameloftDiscover our blog at http://glft.co/Gameloft_Official_Blog for the inside scoop on everything Gameloft. Ice Age Adventures Android Gam..
Dungeon Gems Android Game Free..